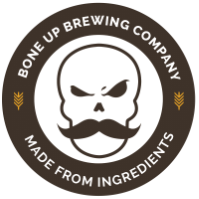 Stats: Biere de Krampus - Bone Up Brewing Co.
Food Pairing: Potatoes au gratin. Music Pairing (Jared's Choice): "Popcorn" by Los Straitjackets. Brewers' Notes: ​ You kids know about Krampus, dontcha? He's the Anti-Santa that stalks the streets with his shackles clackin', flickin' his endlessly-long tonge, ready to remind all you children why it pays to be good. If you're just a little bad he'll hitcha with a switch, but if you're a real mean muggins, he'll scoop you up into the barrel on his back and you best believe it won't be a gentle ride before he tosses you into the fiery pits of hell. Anyway, we think Krampus needs a stronger presence at X-mas, so we named a beer after him! This Belgian-inspired dark holiday beer'll hit ya with deep aromas of dark fruit, spice, and caramelly-bready malt and a smooth, dry finish. This devilishly tasty concoction is sure to fuel some proper holiday mischief! And while our interests in seasonally appropriate legends might be on the darker side, don't you go confusin' us with no Grinch: we got together and collaborated on this here beer with our pals from Stonepath Malt (Wareham) and the Pink Boots Society (Boston Chapter) to celebrate this most festive time of year! $1 from each pour will be donated to the PBS Boston Chapter.